With a CLAD-LIFT vacuum lifting device, a single person can install window sections with or without wooden frames weighing up to 350 kg without sweating or back pain. Due to its versatility, it can be used in many branches, such as the wood and furniture industry as well as the prefabricated house industry. The CLAD-LIFT 350 is flexible, ergonomic and powerful: the telescopic boom, the 360° vertical rotation and the 180° rotation of the workpiece make it possible to mount it from floor to roof. Due to the front wheel drive, the CLAD-LIFT is extremely manoeuvrable and can be used both indoors and outdoors. 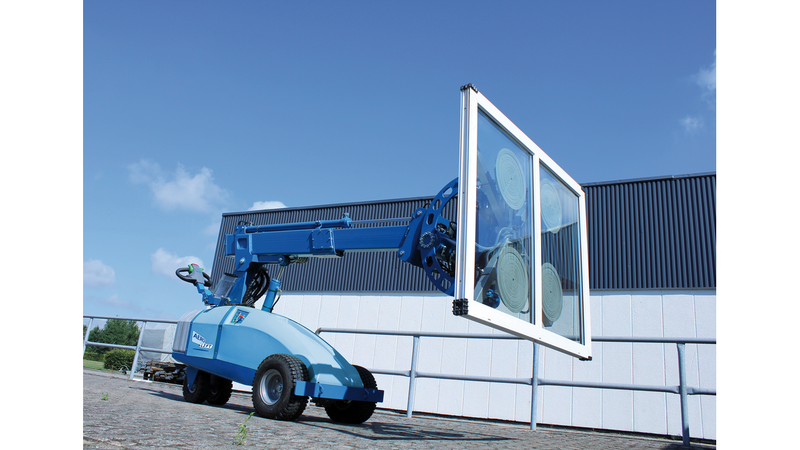 No matter if windows, sheet metal, doors or glass parts: no problem for the CLAD-LIFT 350! The CLAD-LIFT 350 is characterised by a fine-adjustable hydraulic control, which controls the lifting arm and the load powerfully, quickly and particularly gently. Ergonomic and robust at the same time, it enables the load to be pivoted, rotated and swivelled in all directions. The flexible front allows the load to swivel to each side at 90 degrees and offers endless 360 degree rotation. The maximum operating height of the CLAD-LIFT 350 is 2.80 metres. By using the "Ecomatic" battery saving function, the 2 low-maintenance batteries offer up to 8 hours of on-site use. The integrated charger makes it possible to charge the batteries anywhere and at any time via a 230 V plug. The powerful differential drive with infinitely variable speed control and two drive wheels at the front with electronic brakes ensure optimum driving characteristics. Its narrow dimensions allow the CLAD-LIFT 350 to fit through standard interior doors in buildings.